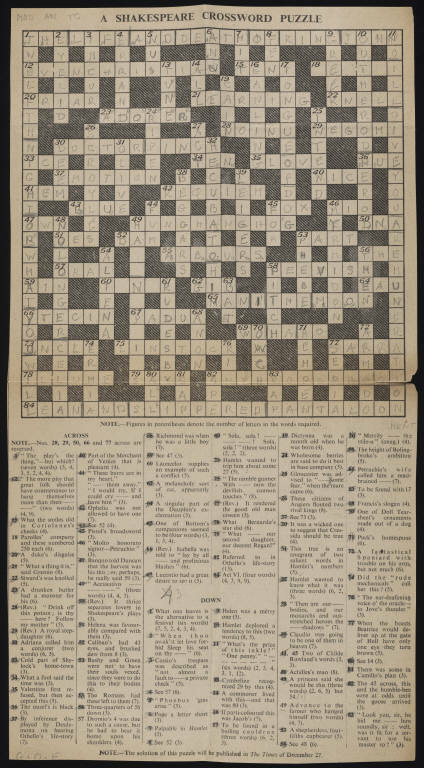 “A Shakespeare Crossword Puzzle” was completed (or almost completed) by bibliographer and Shakespeare scholar Walter Wilson Greg, at some point after its publication on Christmas Eve in the early twentieth century. Greg then tucked the puzzle away in his copy of an 1865 edition of Pericles. Greg’s library was later acquired by the American literary historian and bibliophile, James Marshall Osborn. This entry was posted in Uncategorized by Kathryn James. Bookmark the permalink. Kathryn James is the Curator for Early Modern Books and Manuscripts & the Osborn Collection at Yale University's Beinecke Rare Book and Manuscript Library.